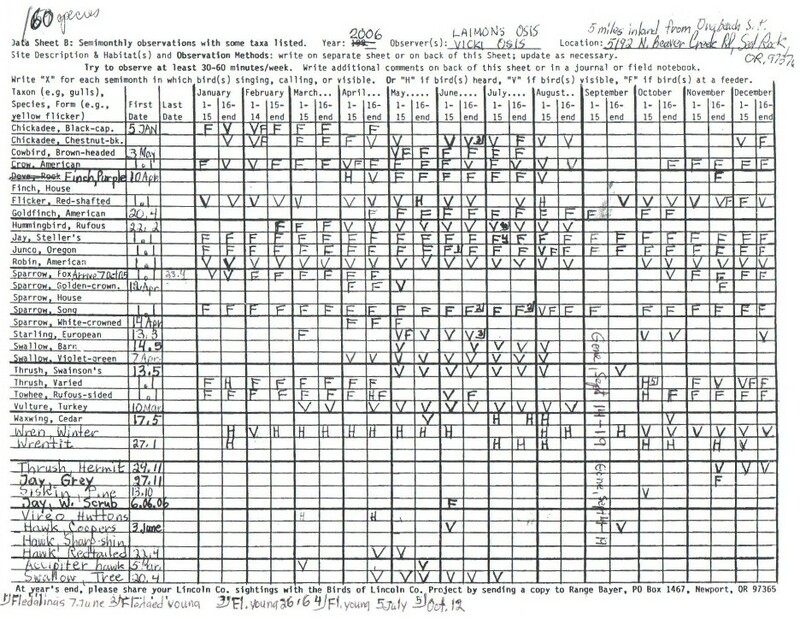 In Data Sheet B for 2006 below, 25 common species in Lincoln County were placed in alphabetical order by last name as they would be in a field guide index, and there were 13 blank rows for additional species below. An alphabetical listing is easier for observers to record species than a taxonomic listing, especially since the taxonomic order has changed dramatically in recent years. They also filled out a Data Sheet A that had the same instructions at the top, but all rows were blank, so that species could be written in. Data Sheets A and B remained unchanged during 1992-2008, but these data forms have been revised to record presence by "X" or an exponential abundance scale of 1-5 and were distributed in December 2008 for 2009 (see Semimonthly Data Forms to Use). See Advantages of Semimonthly Records.